A great solution can be to use an action singing game -> all the benefits of a game with no set-up time. Just stand and begin! 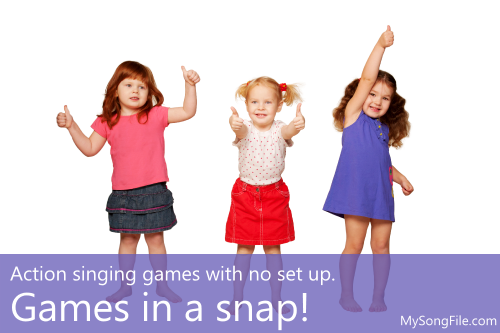 (Some you can even do sitting down) Voila – games in a snap! Below are some fantastic examples, and they're free for a limited time. I use this song as a warm-up and focus activity at the beginning of lessons with 10-14 year old children. A greeting song from Liberia which features 'syncopa' and 'high do'. Children love coming up with new words and actions for this song. Students can use up some excess energy with this singing game in 3/4 time! Reinforce beat with this fun, accumulative song.